Gap Filler is a globally acclaimed creative social enterprise that works with communities – and the public and private sectors – to design and deliver placemaking strategies and programmes that are the foundation for long-term community outcomes. We create installations, events and processes to make places more memorable, fun, participatory, surprising, equitable and sociable. 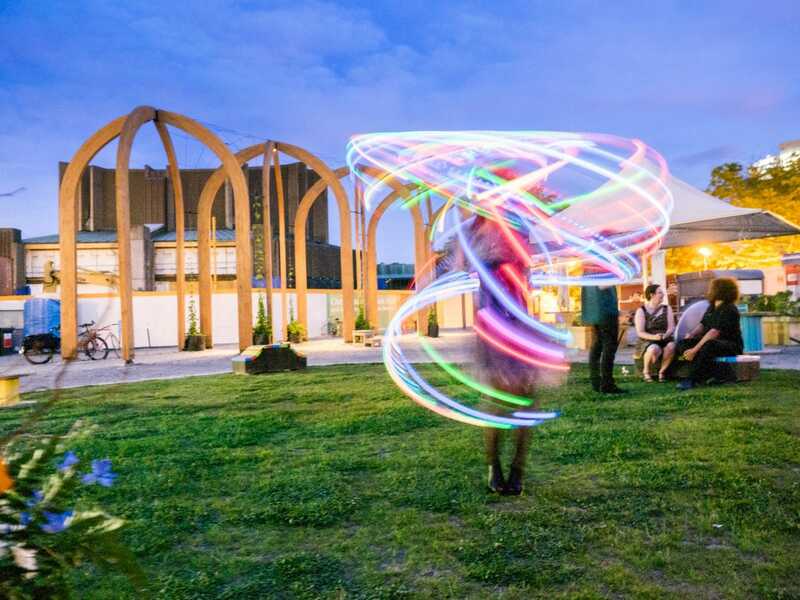 Our testing ground is Ōtautahi Christchurch, where since 2010 our prolific and diverse output has invited people to experiment, engage in and reshape a place undergoing vast and rapid change. Our work has helped shift the identity of our conservative Garden City to “a city where anything is possible” (Christchurch City Council Strategic Framework, 2018). Drawing on this evolutionary experience, we deliver strategies, installations and support services all around Aotearoa New Zealand and the world. Gap Filler invites people to have ‘everyday’ encounters outside their everyday selves and habits, and in so doing imagine and experience a different possible world that is more fun, participatory, surprising, equitable and sociable. A world in which they might play a new part. We get strangers dancing on street corners, workmates making music together, and grandparents and grandkids jumping on giant video game controllers. Gap Filler conducts our experimental interventions in highly visible and public ways, to be accessible and inclusive, to add vitality to places, to demonstrate possibilities to the world and to inspire others to have, and try, their own experiments. Gap Filler takes a holistic approach, designing unique public installations whilst also exploring and promoting novel legal agreements, organisational processes, financial mechanisms, governance structures and policies that underpin strong communities. We are engaged and responsive, and help grow wider public awareness of civic issues. We give people (implicit) permission to become active citizens, and create opportunities for people to find their own voices and avenues for participation beyond the traditional and sanctioned modes on offer. We invent safe ways around the obstacles that prevent positive social change and will often act as an intermediary or guarantor: we are happy to do some of the risk-taking that government agencies and large institutions aren’t set up for. As we all face the global environmental challenges of the present and future, we must continually reflect, reimagine and redesign our systems, processes and actions to meet the needs and new potentials that arise. Gap Filler makes systemic social change feel desirable, eminently possible and a natural evolution from the global placemaking work already underway. We strive to make the act of reimagining the world joyful, tangible and infectious. Gap Filler is a registered charitable trust that works with all manner of community groups, companies, business associations, residents associations, local and regional governments, transport and development agencies, property developers and more. We believe in encouraging and promoting community spirit, growth and awareness by assisting people to experience and participate in creative projects that shape the places where they live. ‘Community spirit’ is necessarily related to the idea of ‘the public good’: communities are strongest when working together for public benefit, social capital and a flourishing environment. Participation is an element of all of our projects but enters at different stages and in different ways, as appropriate depending upon the project. Our mode of project development is generally propositional: we don’t ask people what they want and deliver that; we work with people to get a sense of their place, their desires, their passions – and deliver surprising projects that help unlock their potential. We value trying out new things and not repeating ourselves, taking calculated risks to lead by example. Experimentation might entail a scientific approach of testing hypotheses and monitoring results; or a more artistic approach of open curiosity, experimenting to discover what communities really need or desire. Often, experimentation means challenging ourselves to keep stretching boundaries, and continuing to innovate new ways to grow community in any context. Through partnerships, we can be the face of experimentation, to make it feel fun and safe for others. We believe in leadership, expressing our values through fearless implementation – by doing. We want to celebrate playfulness, hope, critique and positivity. We are living out our values in, and contributing to, a flourishing city. Trailblazers are only worthwhile if others can, and do, follow the trail – and if it leads somewhere purposeful or interesting. We recognise that we need to lead from the front through what we do, but also be good storytellers, be the signposts to mark the way, be the custodians maintaining the trail, be the drumline motivating people and spurring them on – or find others to support us in playing all of those roles. We esteem the spirit of innovation, exploring new ways of engaging, creating and realising ideas, honouring and promoting creative practice and process. Playfulness is our niche: we use surprise and delight in abundance, and try to merge optimism and critical thinking. We employ creativity in our projects, our processes, within our organisation and in our relations with others. We believe that creative gestures help humanise places. We understand and value resourcefulness as meaning both adaptability and a commitment to re-use, re-purpose and recycle wherever possible. We try to employ full lifecycle thinking in everything we create and every material we use. People and their time, energy and passions are the most precious resources – and don’t often appear in project budgets. We constantly search for ways to value, and grow, all of a community’s resources. We believe in seeking out partners to implement ideas together, as well as cooperating to realise others’ ideas. We feel that collaboration unlocks creative potential. We often play a ‘translator’ role to enable wider collaboration, for instance helping to frame grassroots concerns in a way that’s understandable to those in power, or government policies in a way that’s accessible to those who have no prior experience of them. We strive to honour the Treaty of Waitangi/Te Tiriti in our projects, approach and relationships. We believe in honouring the stories and histories of our places – Ōtautahi Christchurch and Aotearoa New Zealand. Many of our Gap Filler values and principles have been in practice for countless generations by tangata whenua. We still have much to learn. Gap Filler is a creative urban regeneration initiative that facilitates a wide range of temporary projects, events, installations and amenities in the city.